It takes a lot to phase a freestyle motocross rider, but having to ride 192 metres above the ground will do it. 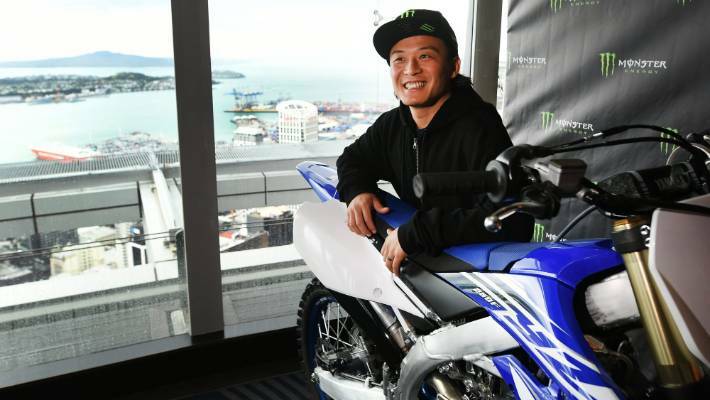 On Wednesday, Auckland's Sky Tower played host to a brand new world record attempt when Japan's Taka Higashino rode his motocross bike around the outside of the southern hemisphere's tallest structure. The 33-year-old is in New Zealand for this weekend's SX-Open, at Mount Smart Stadium. And while Higashino, a three-times X-Games gold medallist, is used to pushing the envelope he said this particular stunt was "on another level". "I'm actually afraid of heights, and this was not exactly what I was expecting," he said. Higashino said he was expecting the Sky Walk platform to be wider "and to have a railing"
Montra team rider Taka Higashino poses with his bike, ahead of his world record attempt. Still, the daredevil managed to pull off what few would dare to try. "The first time around, halfway I wanted to cry, stop and jump off. The view was trippy, I was going 'Oh my god, I can't watch'," Higashino said. "Sometimes, watching the floor felt like a dream, not real. Taka Higashino gets his first look at the view from Auckland's Sky Tower. "It was crazy when the wind came up, the bike was losing balance, the rope had tension too. It looks easy out there but it's actually pretty hard. It was pretty scary." Thankful to be off the platform, Higashino would return to his more comfortable setting of dirt ramps in preparation for Saturday's event. More than 6000 tonnes of dirt have been bought into the stadium for the event and 25,000 tickets have been sold.